After a four-day delay, NASA is planning to fire off five rockets in just over five minutes late Monday (March 19) for a mission that, if all goes well, will create glowing clouds to probe mysterious, fast-moving winds at the edge of space. The five-rocket salvo, which is scheduled to launch Sunday night from NASA's Wallops Flight Facility in Virginia, forms the core of the agency's Anomalous Transport Rocket Experiment, or ATREX. The unmanned rockets will release chemical tracers at about 60 miles (97 kilometers) up, allowing scientists to track high-altitude winds that can top 300 mph (483 kph). These tracers will generate luminous milky-white clouds that should be visible to folks on the ground from parts of South Carolina up through southern New England, researchers have said. ATREX was originally scheduled to lift off Wednesday (March 14), but a radio system glitch on one of the rockets and anticipated bad weather delayed the launch until Saturday night (March 17). On Friday afternoon, NASA officials announced that the launch had been pushed back to Sunday, again due to weather concerns. The same concerns pushed the launch to Monday night, they added. The $4 million ATREX mission aims to study the high-altitude jet stream, which whistles along 60 to 65 miles (97 to 105 km) above Earth's surface —much higher up than the jet stream commonly referred to in weather forecasts, which is found at an altitude of just 6 miles (10 km) or so. ATREX's five sounding rockets will launch over the Atlantic Ocean within a span of five minutes and 20 seconds. While the rockets' trajectories are different, they'll all release their tracer — a chemical called trimethyl aluminum — roughly simultaneously. Two of the rockets will also carry instruments that measure temperature and atmospheric pressure. 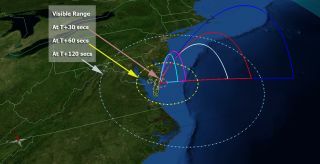 Three different cameras — one at Wallops and one each in New Jersey and North Carolina— will track the tracer clouds, measuring how quickly they move away from each other. The launch must occur at night under clear skies, to make sure the cameras have a clear view of the glowing tracer clouds. That means many skywatchers along the East Coast should get a good look, too. The ATREX launch window extends through April 3, opening no earlier than 11 p.m. EST (0400 GMT) each night and closing no later than 6:30 a.m. EST (1130 GMT) the following morning, NASA officials have said. The rockets being used for the mission are two Terrier-Improved Malemutes, two Terrier-Improved Orions and one Terrier-Oriole. All will fall harmlessly into the Atlantic after they release the trimethyl aluminum. The chemical poses no threat to the environment or human health, researchers said..